As a bodybuilder, you may be more concerned with putting on weight than losing it, so typical "diet foods" like rice cakes might not be on your radar. But rice cakes are a good addition to your diet. They're a good source of high-energy carbs and low in sodium to help prevent fluid retention. Rice cakes are not only low in calories, but also fat-free. One cake has 35 calories, 7 grams of carbs, 0.5 gram of fiber and 1 gram of protein. It's also a good source of manganese, meeting 17 percent of the daily value. Although not a significant source of any other nutrient, rice cakes can help boost your intake of niacin, magnesium, selenium and phosphorus. When it comes to nutrition as a bodybuilder, your focus may be protein. But carbs are an important part of your diet plan, providing the energy your muscles need to lift those weights. 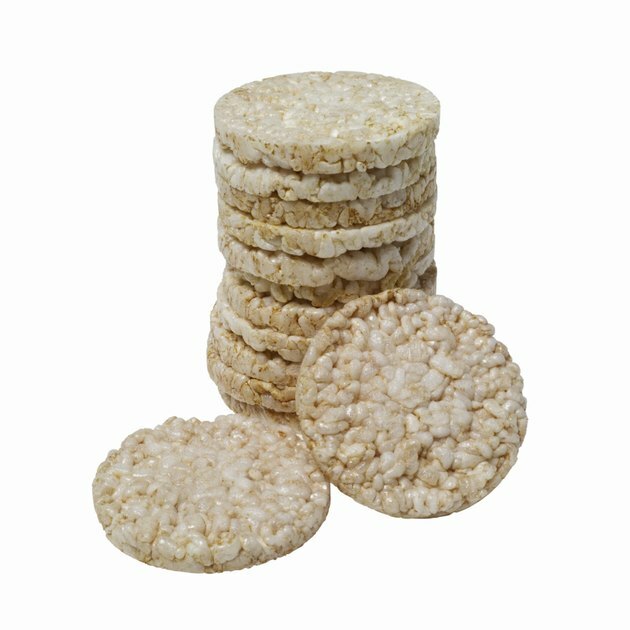 Rice cakes are considered a high-glycemic food, which means they digest fast and act as a quick source of energy, so they're a good pre-workout carb choice. Rice cakes can also be part of a nourishing post-workout meal, which is necessary for replenishing energy stores. As a low-sodium food, with 29 milligrams per serving, rice cakes are a good choice when trying to limit your sodium intake to improve muscle definition. Limiting your sodium intake helps prevent fluid retention and is the safest way to cut weight before a competition, according to Human Kinetics. A 1,500-milligram sodium diet is considered very low-sodium, but you can survive on 250 milligrams of sodium a day, according to Clemson Cooperative Extension. You can eat rice cakes plain, but it's better to combine them with foods high in protein and healthy fat. For a pre-workout snack, top your rice cake with turkey and fresh cranberry sauce or tuna with a touch of balsamic vinegar. After your workout, get the carbs, protein and fat your body needs by topping your rice cake with peanut butter and sliced bananas. Or smear some avocado on your cake and top it with thinly sliced chicken breast. Clemson Cooperative Extension: Halt Salt!